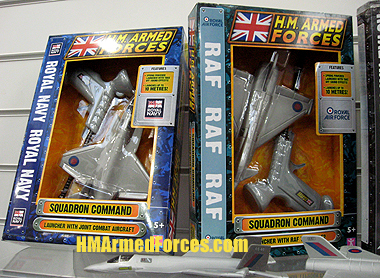 HM Armed Forces Squadron Command comes in two versions – an RAF version and the Royal Navy Launcher with Joint Combat Aircraft. This Squadron Command HMAF toy aircraft comes with a spring-powered handheld launcher capable of firing it up to a distance of 10 metres. Not only that but the Squadron Command launcher features realistic take off sound effects as the Joint Combat Aircraft flies through the air. HMAF Squadron Command is without doubt a must-have toy for all aspiring military aviators.